MILFORD - Nicolas Guaman, accused of dragging a motorcyclist for a quarter of a mile after a collision, showed not a flicker of emotion when police told him the motorcyclist was dead, a document filed in court yesterday showed. He simply shrugged, police said. Guaman appeared yesterday in Milford District Court, where he pleaded not guilty to eight charges, including vehicular homicide while under the influence, failure to stop for police, unlicensed operation of a motor vehicle, and reckless conduct creating risk to a child. An immigrant from Ecuador living illegally in the United States, Guaman may face deportation by the Immigration and Customs Enforcement agency following his arrest. Guaman was allegedly drunk when his Ford pickup collided with a motorcycle ridden by Matthew Denice, 23, of Milford at Congress and Fayette streets about 7:50 p.m. Saturday. Guaman’s 6-year-old son sat next to him in the truck. 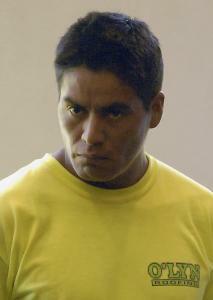 As Guaman appeared in court, Denice’s family cried from the front two rows. Bail was set at $100,000, and Guaman remains in Worcester County jail. He is scheduled to appear in court again Sept. 12. Craig Tavares, Guaman’s court-appointed attorney, declined to comment yesterday because he is not permanently assigned to the case. Some officials said the case showed why Massachusetts should embrace the federal program known as Secure Communities, a computer-based system launched in 2008 that automatically cross-checks the fingerprints of everyone who is arrested against immigration databases, alerting immigration authorities so they can take action against those here illegally. State Senator Richard T. Moore, a Democrat from Uxbridge, wrote Governor Deval Patrick yesterday urging him to crack down on illegal immigrants driving without a license. Spokesmen for Patrick did not comment on the debate yesterday, but expressed condolences to Denice’s family. Denice was trapped in the truck’s passenger-side wheelwell, screaming, as Guaman drove away, police said. Despite frantic efforts by passersby, who chased after the truck and pounded on the windows, Guaman allegedly drove a quarter of a mile before turning and driving onto a curb, dislodging Denice from the wheelwell. Then, witnesses told police, Guaman backed off the curb, running over Denice’s body, and continued down the street. Police cruisers chased him for several blocks before he stopped. When officers opened the door of the truck, they saw Budweiser beer cans on the passenger seat and on the floor. Guaman’s eyes were glassy and bloodshot. The truck’s cab reeked of alcohol, Arce wrote. When police pulled Guaman from the truck and attempted to handcuff him, a little boy jumped out and began punching and kicking the officers, yelling at them to leave his father alone. The boy was Johnathan, Guaman’s son. Saturday was his sixth birthday, said Paul Jarvey, a spokesman for the Worcester district attorney’s office. Guaman failed several sobriety tests, police said. He told police the accident was not his fault and said he did not stop “because his truck was damaged and he didn’t know what to do,’’ the report said. The signs of impending tragedy were evident two hours before the accident. Guaman, who lives in Milford, had spent the day drinking. His sister-in-law was so concerned she asked her daughter to alert police once Guaman drove away. Police searched the area but did not find his truck. The truck Guaman was driving was registered to his brother, Pablo Guaman, who has been charged with allowing an unlicensed driver to operate a motor vehicle, the report said. Maria Yupanqui, Guaman’s wife of 15 years, said after the arraignment that her husband often drinks excessively. She wants him to be deported so he can return to Ecuador, where their three older children live. Denice’s mother, stepfather, and brother talked about the passionate young man devoted to his family and obsessed with Boston sports teams. Her husband, Michael Maloney, said Guaman’s immigration status is less important than the horrific action he appears to have taken Saturday night. The couple said they are pushing for Guaman to receive a life sentence. Wilson Valdez, who came to the arraignment, owns a convenience store called Unienvios in Milford, where Guaman and his family were regulars. Valdez said he is worried that Guaman’s arrest will taint public perception about his community. Martine Powers can be reached at mpowers@globe.com; Maria Sacchetti can be reached at msacchetti@globe.com.